Last week we changed up the format of our DMW videos, and we’ve had nothing but positive feedback - so it looks like this new format is here to stay! Just to recap, each week we give you a quick summary of the big news in the fast moving worlds of Video Marketing, SEO and Social Media. Catch up on this week's Digital Marketing news, by watching this video. Want to read instead of watching the video? It shouldn't come to you as a surprise that video is the number one way people now consume content. During a recent conference call, Mark Zuckerberg called video "A megatrend of the same order as mobile". 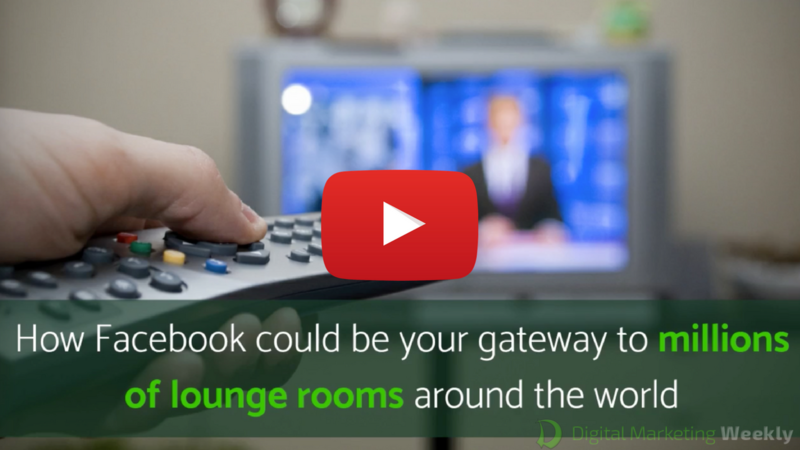 Facebook have just announced their new development; a video app for set top boxes, which will bring Facebook directly into living rooms around the world! This new move from Facebook is incredible news, as it will be another way to get your videos in front of a growing worldwide audience. The best part is that this could be a completely new audience who don't consume video content on their phones or computers. Here’s a staggering statistic - there were 27.6 million tweets that used the #SB51 hashtag during last Sunday’s Superbowl! With the Patriots down 28-3, the Canadian tennis player called an Atlanta Falcon's victory. In response, a Missouri student named John Goehrke tweeted “If the patriots win we go on a date?” To his surprise she agreed. After the Patriots record breaking comeback, Bourchard later tweeted “...I will do it, I stay true to my word”. News of the date made the day’s Twitter moments and was picked up by Sports Illustrated and ESPN. It is likely to get world wide publicity if they go through with the date. So what does mean for marketers? Well, to put it simply, getting involved on Social Media during large events like the Superbowl is a great way to connect with people, build your audience and let your followers know what you stand for. Whilst content, and in particular video content, is going to play a huge part in your online marketing in 2017, getting the SEO fundamentals right is still critical to your success. Google are still looking for backlinks, and the more you have, the more they consider your content relevant. If your content earns a lot of high-quality backlinks, you hit three important ranking signals: number of backlinks, link authority, and link diversity. However instead of trying to artificially build backlinks, the key is to create high quality content that gets linked to naturally. All of the top 100 most visible domains have mobile-friendly solutions, according to SearchMetrics, which means Mobile optimization is now an extremely important ranking factor! In fact these days it's not enough to think "mobile-friendly", you should be thinking "mobile-first". Encryption, H1 and H2 Headings are also factors that you should keep an eye on. Sites with HTTPS encryption will rank better than their HTTP counterparts, and, as of 2017, websites that have not switched to HTTPS are now marked as unsafe in Google Chrome. There is strong evidence that using H1 and H2 tags on your landing page, will increase your chance of getting a higher rank - it's an easy thing to do, so it's worth it!